Anjum Anand is often referred to as Indian Nigella Lawson. Passionate and personal, traditional yet contemporary, rich in flavors and healthy at the same time – is what Anjum Anand’s recipes are about! 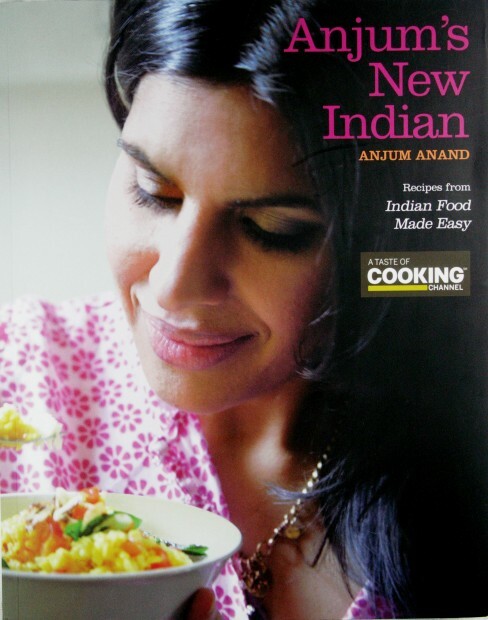 A big thanks to the Wiley Publishers, for allowing me to do a review of Anjum Anand’s Anjum’s New Indian. 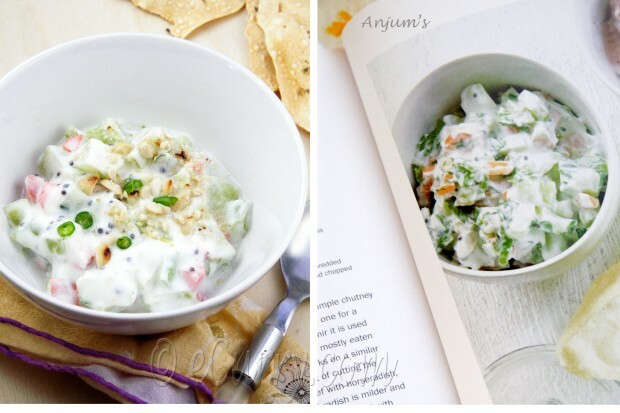 This latest book, “Anjum’s New Indian” features recipes from her BBC show, “Indian Food Made Easy” along with some others. 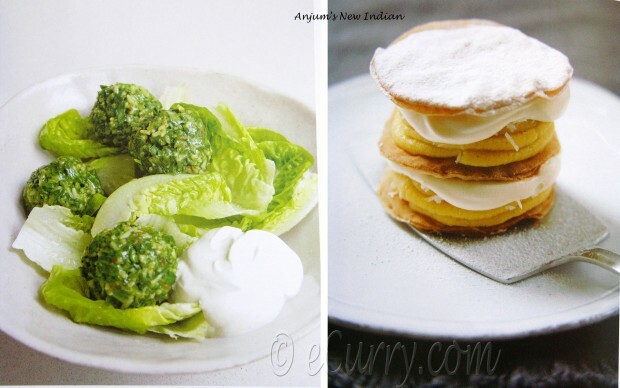 You’ll find a collection of more than a hundred delicious recipes accompanied by very appealing photographs. It is a well constructed, elaborate, containing of 256 pages. 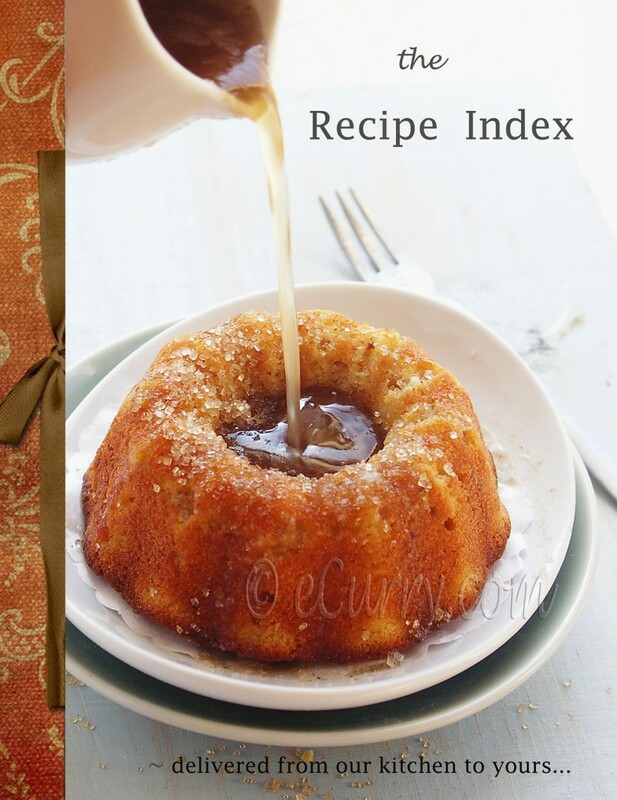 The presentation of the book is simple and inviting which will make you want to reach out for a bowl and try out each and every one of the recipes right away. 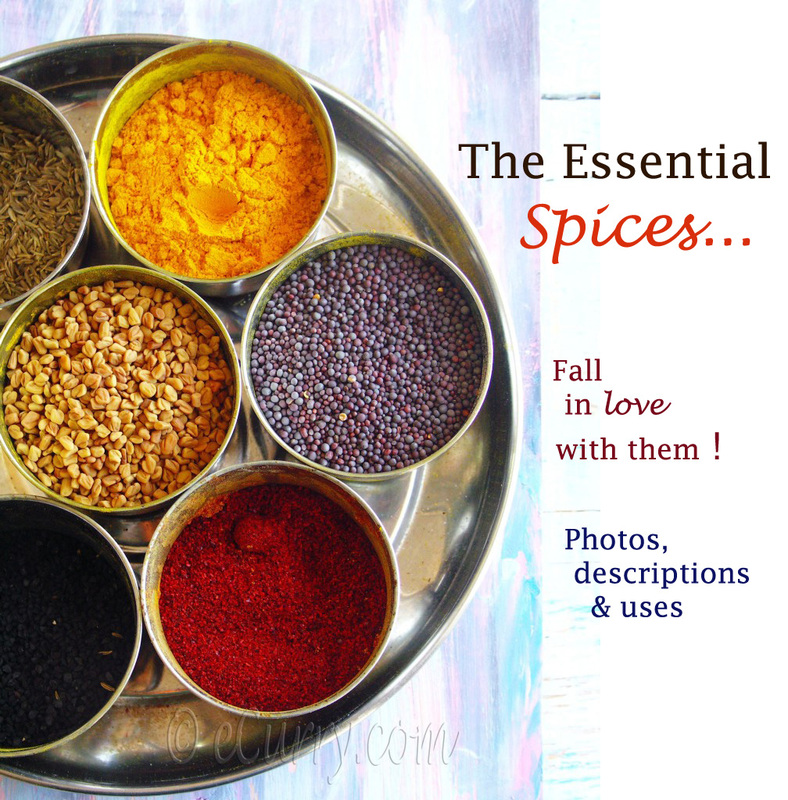 The cookbook begins with the Basic Recipes used in Indian cooking – garam masala, black masala. 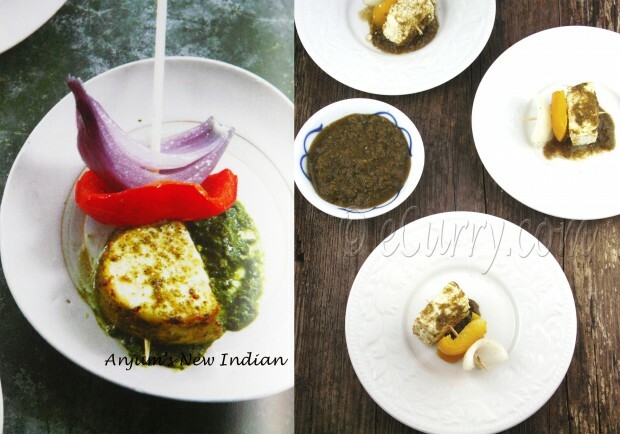 paneer, yogurt, spice/masala mixes and pastes like the Goan Red Curry paste. It also has a section where she concisely explains the little but important details – how to brown the basic onion, tomatoes and spices to develop the flavors, how to pick the right ingredients, stressing on local, fresh and seasonal. 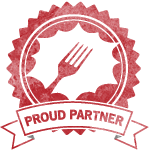 I feel this is a invaluable for someone who would be trying out the cuisine for the very first time. The book is divided into sections as a full course meal would develop; Light Meals and Snacks, Fish and Seafood, Chicken, Meat, Vegetables, Beans and Lentils, Rice and Bread, Raitas and Chutneys, Desserts and Drinks, and then followed by a very helpful Glossary and Index. What I really like about the lay out is that the recipes are not listed on the basis of their origin and region. It makes is so much easier to choose from each section. Few, but fresh ingredients, uncomplicated style and the wonderful photographs of the final dishes make it the most non intimidating cookbook ever. The style is unimposing and the recipes require minimum effort and preparation. The collection of the recipes in this book is a lovely blend of traditional and non traditional. She specifically mentions if the recipe is not so traditional and the changes she has made and why she has made changes. 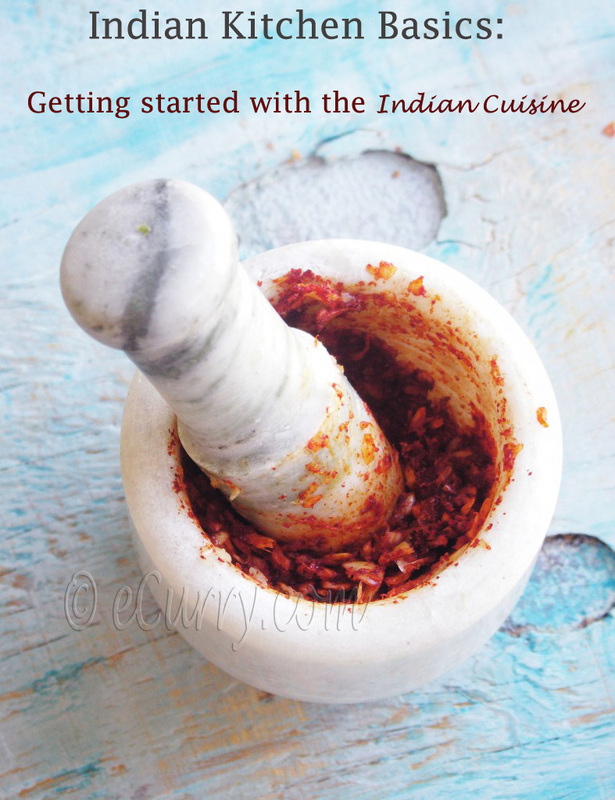 For example the book includes a recipe for well known Rogan Josh, but she calls it “My Rogan Josh“, or the Goan Bebinca is “My Coconut Bebinca“ (pg. 241) and specifies in details the changes she has made to the original. Her recipes are varied, as the the dishes and flavors are chosen from every region of India. Every state in India had its own signature dishes, and spices and method of cooking. She has amalgamated in all of their flavors and taste in her own beautiful way in her book. All of the recipes in the book are healthy, succulent, full of flavor and nice color, just like she says – “… When deciding on a menu, I consider nutrition, textures and colors…” She uses all the flavorful spices as well as ingredients moderately, stressing on maximizing the flavors while using fresh and healthy ingredients. 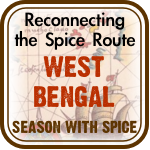 The recipes do call for many spices, which is the synonymous to Indian cuisine and you might have to make a trip to the groceries, but these are the kind of spices that will keep in your pantry for months. 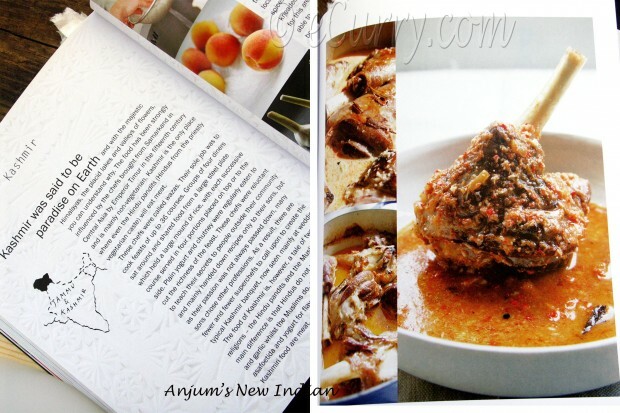 Some pages are devoted to the origin of the dish, influences as well as Anjum’s own experiences with food. “When it comes to food, we must first understand our bodies and nature of food and only then can we make informed choices to remain in balance”. Her honest views throughout the book gives an insight to what she has in mind when she presents her recipes to the world. These little essays will give the freedom to the readers to go out and explore their own views and appreciate the way they feel about the recipes and connect to them. I have tried out quite a few recipes from the book and loved them all. Over time you will see many more that I will post in my space. Very quick and easy way to fulfill a sweet craving. These will remind you of the shortbread cookies, but so uncomplicated that a child could make them. I did the oven version (the recipe mentions both the stove top and oven methods). This is a wonderful light and nutritious salad – vegetables lightly combined with nuts and tempered with spices. I have been making this quite often. 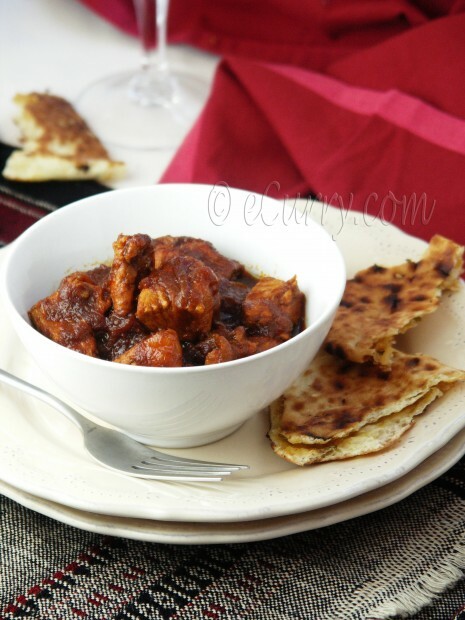 A very exotic chicken curry with the very unusual ingredients. It was really easy to make and was tangy and pleasant with great depth of flavors. These skewered Paneer are a lovely twist to the everyday Paneer Tikka – “Delicate and light”, and fresh flavors make it a wonderful vegetarian appetizer. Being an Indian myself, I found some traditional recipes from my state, where I grew up – West Bengal; needless to say I was delighted. Bengali Squash with Chickpeas (Pg. 151), Bengali Red Lentils (Pg. 172), Bengali Tomato Chutney (Pg. 222), Coconut and Mustard Shrimp (Pg. 68-69) are very close to the kind that I have had since childhood and I have already posted in my blog. 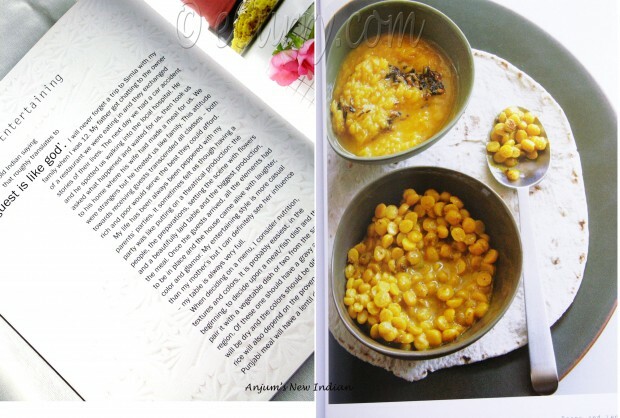 The book is well rounded to include some-Indian recipes too! Indian Shepherd’s Pie (Pg. 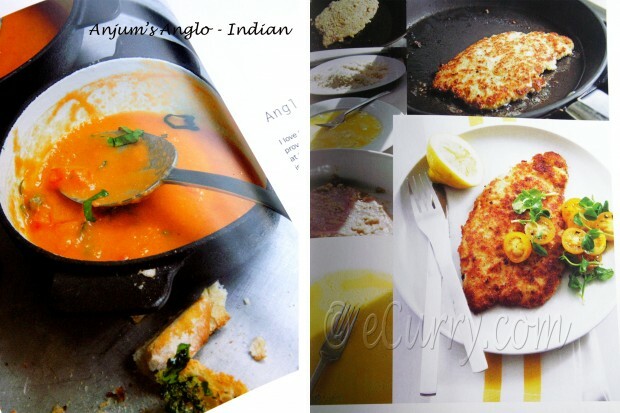 115) and Raj’s Chicken Cutlet (Pg.98), Anglo-Indian Tomato Soup (Pg. 41) are few of them. Anglo-Indian recipes are a natural fusion that occurred when the British ruled and the Anglo-Indian recipes still rule some part of eastern India. Some recipes are very original and non-traditional but incorporating Indian flavors and spices at the same time; Punjabi Cranachan (Pg. 235), Chicken with Sour Cream and Bell Pepper (Pg. 92). While some are very traditional but with a contemporary twist; My Coconut Bebinca (Pg. 241), Peshawari Bread Raita (Pg. 217), Gujarati Fries with Cashews (Pg. 169), Dried Pomegranate Chicken(Pg. 97), Keralan Salmon Wraps (Pg. 77), Trout with White Poppy Seeds (Pg. 55) and Chicken Tikka Salad (Pg. 21) are just a few to mention. 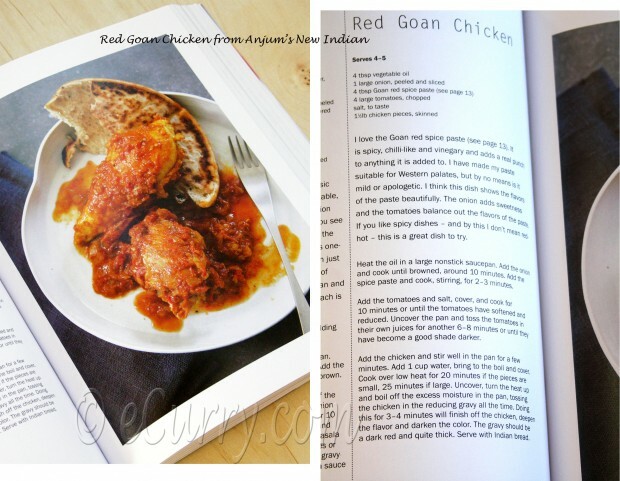 Today I will share the recipe for Anjum’s Red Goan Chicken. Blend all the ingredients together to make a fine paste. Store in a sterilized jar in the fridge for 1 week. Heat the oil in a large nonstick saucepan. Add the onion and cook until browned, around 10 minutes. Add the spice paste and cook, stirring, for 2-3 minutes. Add the tomatoes and the salt, cover, and cook for 10 minutes or until the tomatoes have softened and reduced. Uncover the pan and toss the tomatoes in their own juices for another 6-8 minutes or until they have become good shade darker. Add the chicken and stir well in the pan for a few minutes. Add 1 cup of water, bring to the boil and cover. Cover over low heat for 20 minutes if the pieces are small and 25 minutes if large. Uncover , turn the heat up and boil off excess moisture in the pan, tossing the chicken in the reducing gravy all the time. Doing this for 3-4 minutes will finish off the chicken, deepen the flavor and darken the color. The gravy should be dark red and quite thick. Serve with Indian bread. This is a honest review. My reviews were not influenced in any ways by the views of the author or publisher. Thank you to Wiley Publishers for this wonderful review opportunity. In accordance with FTC rules, I am disclosing that I received the free book mentioned in the post to provide my opinion and review. This was not a paid endorsement nor have I received any form of compensation to do the review. Great job with the review. Sounds like a great cookbook to have. 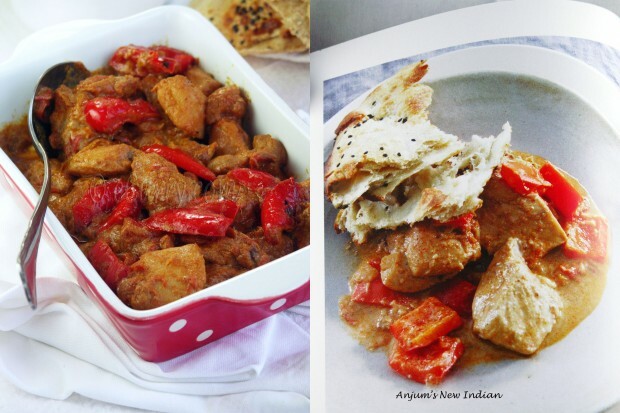 Nice book…chicken looks very tempting….waiting for all the wonderful recipes U tried…. A lovely book! That Goan chcicken is splendid and so mouthwatering! I love her too, I watch her shows in BBC 2 and love it. A wonderfully written rewiew, just reading it one feels like buying the book and you have been really honest about the book. I dont have her books but i have tried her recipe from the BBC food site and I love it too. That red color of the chicken is actually from the 4 tomatoes used. The Goan paste was not red at all. Soma, beautiful work as always. I saw the recipe for chicken with red bell pepper and sour cream in our newspaper. The picture looked very familiar (yours) and saw Anjum Anand’s name mentioned. Soma, I have this book too… I tried Raj’s chicken cutlet and came out good. 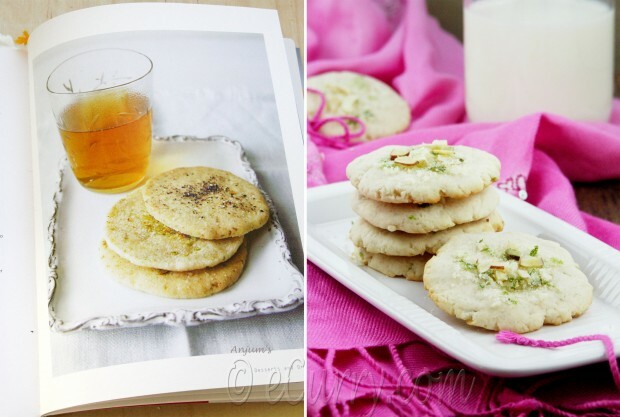 Easy lime cookies are on my to try list and couple of fish recipes too. You did a great job reviewing the book. This book sounds like it’s full of food I would really enjoy, and it sounds like a great to learn more about Indian cooking (which I’ve been wanting to do). I love the ingredients in the Goan red spice paste. The chicken sounds like a fantastic dish! Never knew of Anjum Anand. Just looked up an episode of hers on youtube. Looks interesting. Nice to have people encouraging the globalisation of Indian food! Thanks for the review and recipe, Soma! I’m going to look out for this book. I’d never heard of the Nigella of Indian cooking and would love to know more. Thanks for a a very interesting review. What à gorgeous book and those Side by side photos of yours vs the book are brilliant! I think they should ask you to photograph next time. I might just go and get this book as I love Indian cooking. I used to follow Anjum’s shows regularly on TLC and I just adore her. Love the way you have put the review. Great job! That book sounds amazing,Soma!!! I love Indian food and your review is great! Will check out Anjum’s book for sure and am kinda getting fits looking at that Red Chicken curry 🙁 I so want a hot plate of that now to nurse my poor fingers!! I didn’t know her, but it seems like she’s the kind of chef that I love. Uncomplicated recipes with seasonal ingredients and a strong ethnic influence. Hmm those recipes look delicious! Thanks for posting this great recipe! I will definitely make it again. The chicken with the red bell pepper and sour cream sound amazing…can’t wait to try it!!! You’ve really sold me on this gorgeous book, Soma! It’s too bad my Indian cookbook (and overall cookbook) collection are already so so full. Thanks for sharing your detailed thoughts on the book and your lovely renditions of her recipes. Cook books have always been fascinating reading, even to those who wouldn’t cook like me, :-). The review was good. I’m a complete novice on the subject of cooking, but this recipe was simple and easy even for me! It had been entirely mouth watering!! Thanks with the beautiful one that included this recipe! 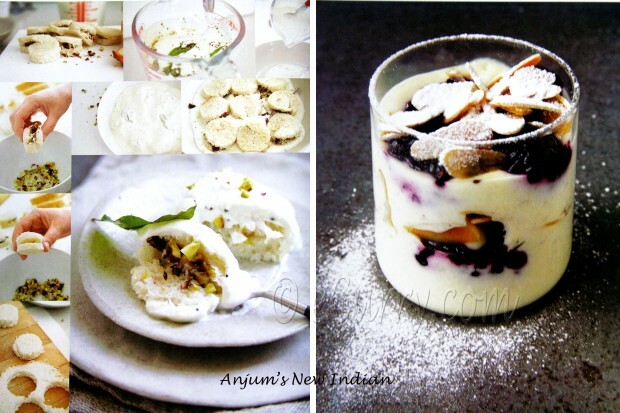 I love Anjum’s recipes and I believe her recipes are genuine and totally in love with them.